Whenever I meet up with old friends, I always like to bake something for them. Last weekend, I met up with a secondary school classmate so I baked these awesome -looking cookies for her. I saw this recipe not too long ago and I was immediately hooked. 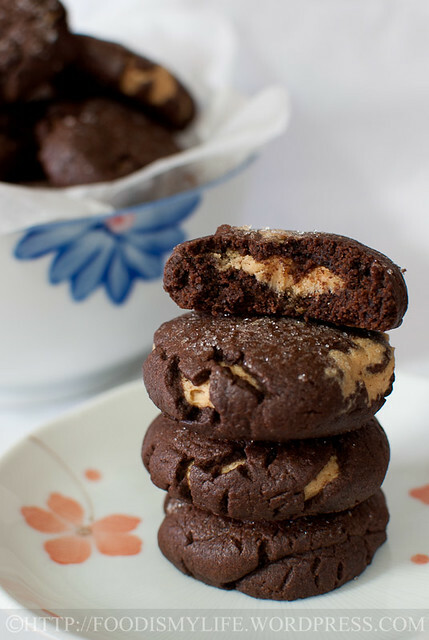 Who could resist a chocolate cookie with a peanut butter filling? I had a little trouble wrapping the cookies too because I used lesser icing sugar in the filling, the filling was really soft and it was hard to fully enclose it. Some peanut butter filling oozed out in the first few cookies but luckily it got better after some practice. Another note is the flattening of cookies. I refrigerated the wrapped cookies as I was baking them in batches (because of my small oven, I could only bake 8 at a time…) and it was a mistake. The cookie dough hardened in the fridge, resulting it to crack when I flattened it. So I left the rest to come to room temperature before flattening and the results were much better. Despite all the imperfections, the cookies were divine. 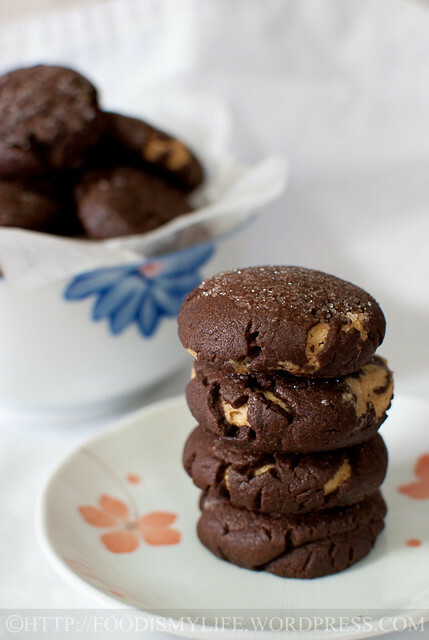 I love the strong peanut butter flavour in the cookies and I really couldn’t stop at one… I’m definitely making these again as i want to perfect them the next time. 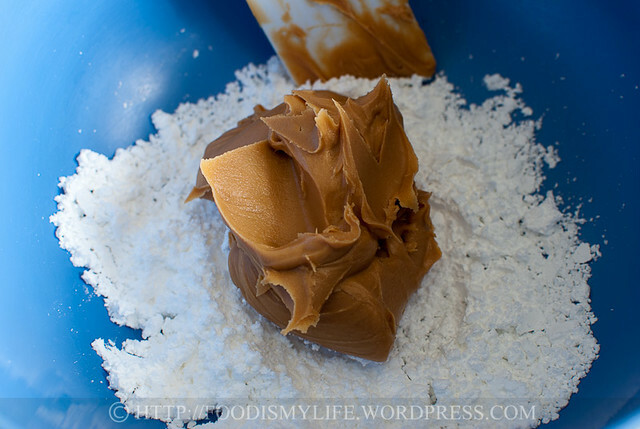 Make the filling first: peanut butter and icing sugar in a mixing bowl. Cream with an electric mixer until smooth. Try to resist from eating it straight away! Make the the chocolate filling next: first measure flour, cocoa, baking powder and salt in a bowl. 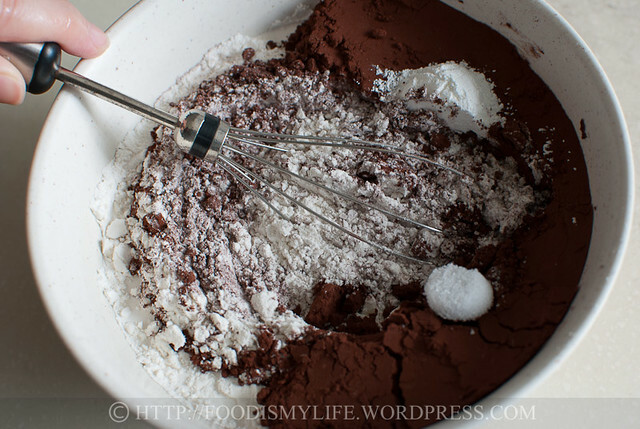 Whisk gently until they are all mixed together. 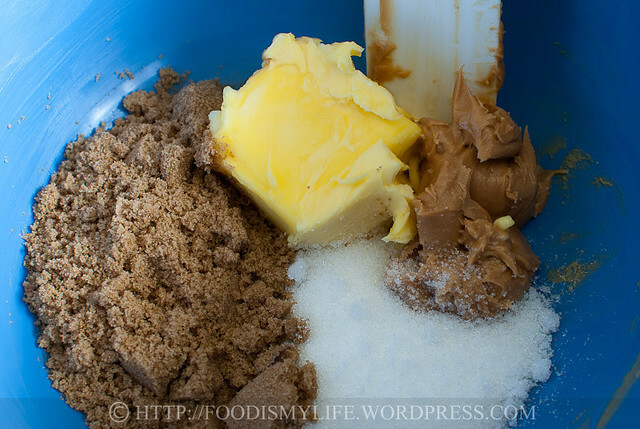 Caster sugar, brown sugar, butter and peanut butter in another mixing bowl. Cream until very light and fluffy – I didn’t bother to wash the beaters that I used to beat the filling. Add in egg and vanilla extract and beat until fully incorporated. Add in half of the flour mixture. 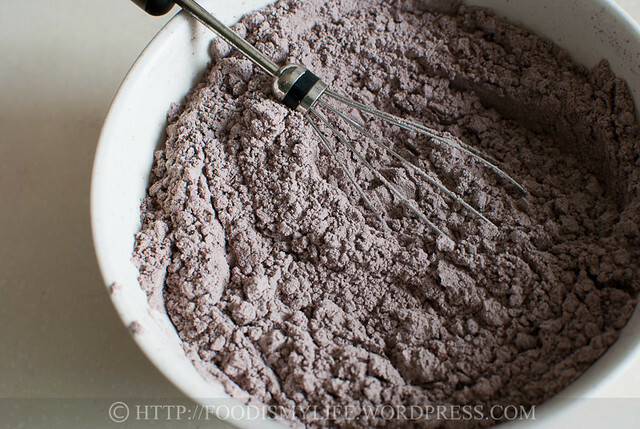 Stir the flour mixture in with a large metal spoon or rubber spatula. This is not cake so you don’t have to be extremely gentle here. Add in the rest of the flour mixture. Stir it in again. Again, you don’t have to be gentle, but don’t go create a “flour storm”! Divide into 30 equal portions. When ready to wrap, take one cookie dough, flatten it slightly. Place a little peanut butter filling in the middle. 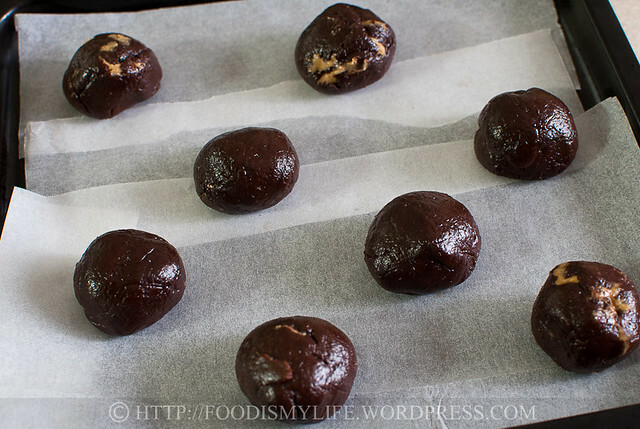 Wrap to enclose the filling and place them on a cookie sheet. Flatten with a glass dipped in sugar (caster or granulated, up to you!) and bake for 10-12 minutes until the top begins to crack. 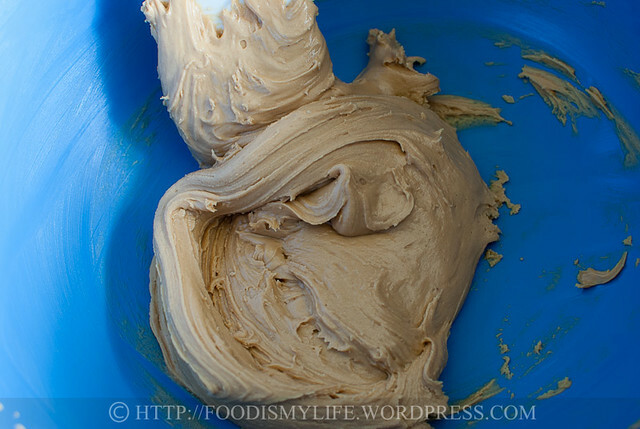 Place 60 grams (1/2 cup) of icing sugar and peanut butter in a medium bowl. 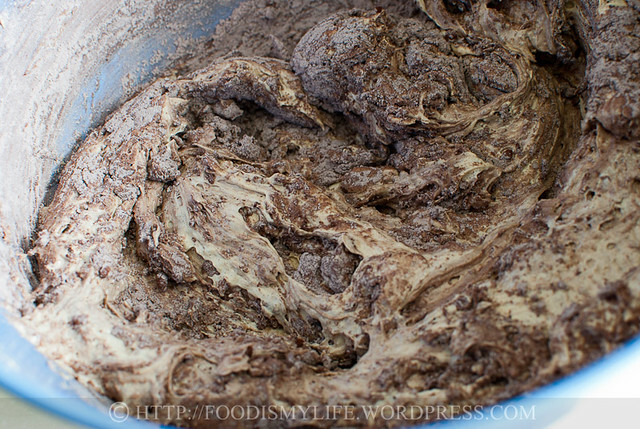 Beat the mixture with an electric mixer until smooth. The filling would be smooth and creamy. Set aside. If you want a stiffer filling, beat in the remaining 30 grams (1/4 cup) of icing sugar. It should be stiff enough to be rolled into balls. Line a baking sheet or a plate with plastic wrap. 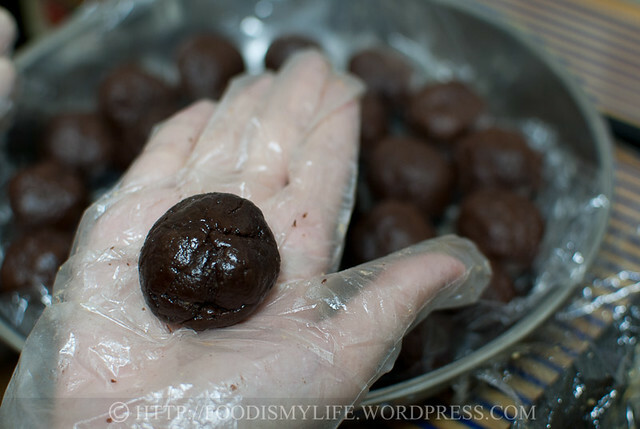 Divide the filling into 30 equal portions and roll into balls. 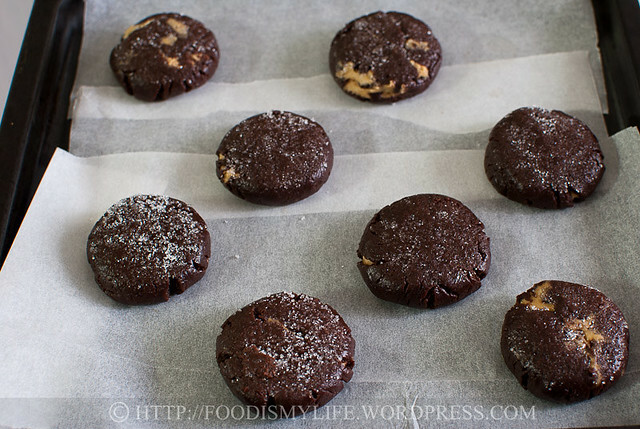 Place it on the baking sheet (keeping them apart) and freeze them while you prepare the cookie dough. 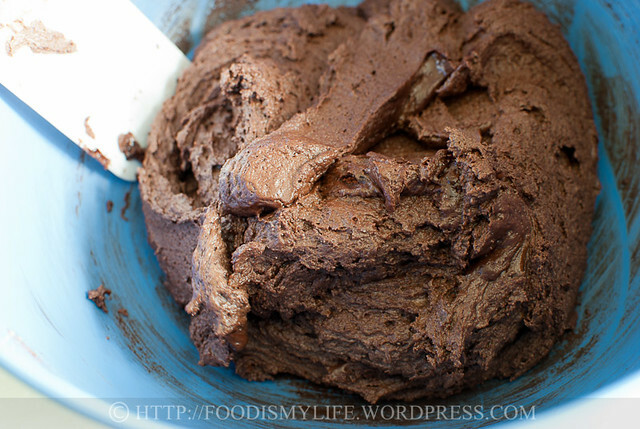 In a small bowl, combine the flour, cocoa powder, baking powder and salt. Whisk it gently to mix them altogether. Set aside. 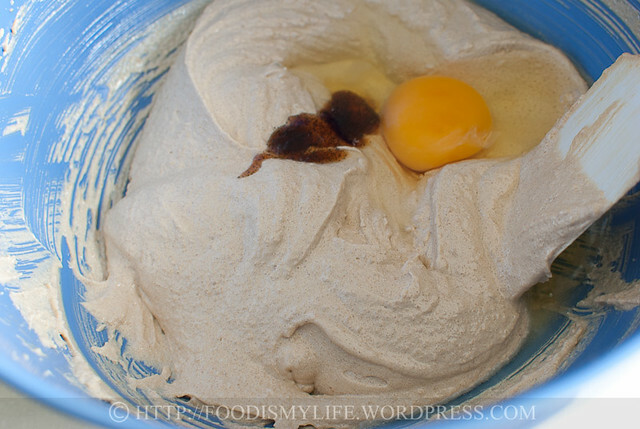 In a large bowl, combine caster sugar, brown sugar, butter and peanut butter. 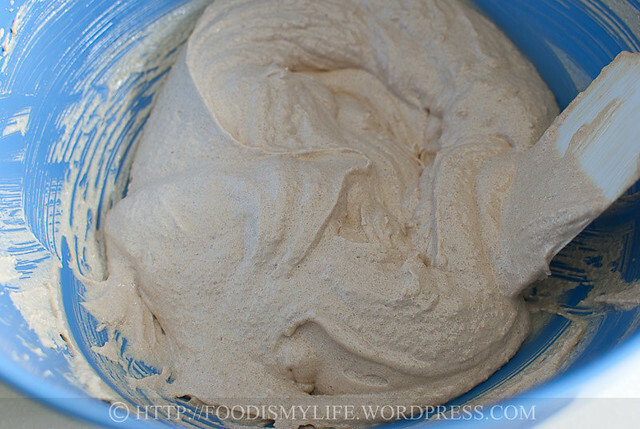 Beat with an electric mixer on medium-high speed until the mixture is smooth and creamy, scraping down the sides occasionally, about 5 minutes. Scrape down the sides and add in the vanilla extract and egg. Beat with an electric mixer on medium speed until fully incorporated, about 1 minute. 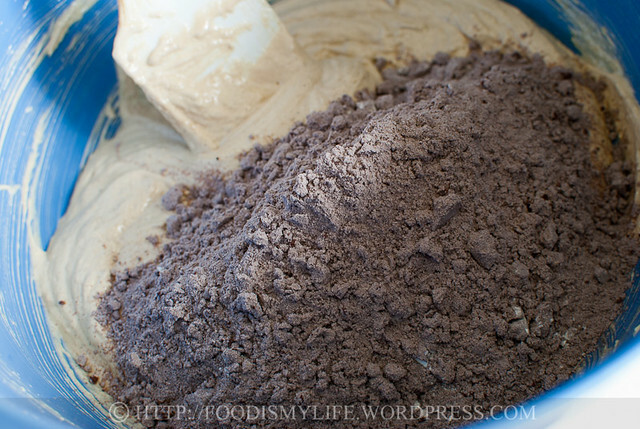 Add in half of the flour mixture into the cookie batter. 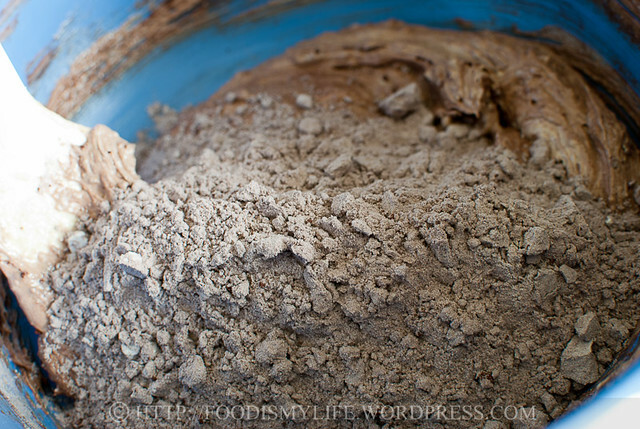 Stir with a spatula until almost incorporated, then add in the remaining flour mixture. 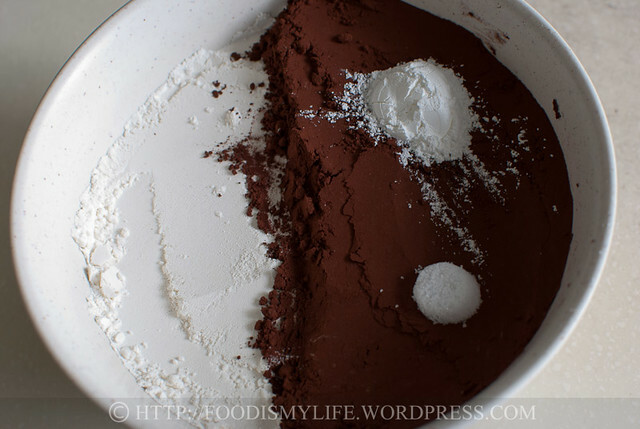 Mix until the no streak of flour remains. Line another baking sheet (or a big plate) with plastic wrap. 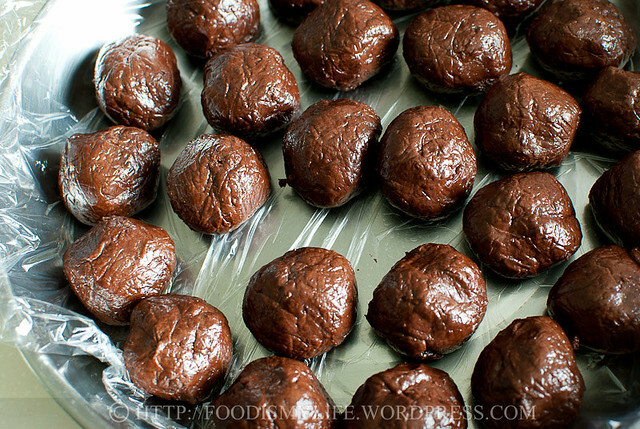 Divide the cookie dough into 30 portions and roll them into balls. Refrigerate them until you are ready to assemble the cookies. Preheat the oven to 185 degrees Celsius. Line a baking sheet with parchment paper. Take one portion of cookie dough and flatten it with your hands. Scoop a teaspoon of filling onto the centre of the dough (or place a portion of the frozen filling in the centre of the dough) and wrap it up to enclose the filling. Roll it into a ball. Repeat until all chocolate balls have been filled. Place the cookies onto the baking sheet. Dip the bottom of a glass (or a shot glass) into the caster sugar and flatten the cookie slightly. Dipping into sugar will prevent the cookie from sticking to the bottom of the glass. If you don't want the caster sugar topping, simply use the heel of your hand and gently press the cookie to flatten it. Bake for 10 minutes for soft cookies and 12 minutes for slightly crispy ones. Let the cookies cool on a wire rack completely before storing. Store the cookies in an air-tight container up to 7 days. The peanut butter on the inside is such a simple thing, but I can only imagine how awesome it is!! I definitely need to add this to my to do list. Thank you! They are really delicious! This looks like such yummy, yummy biscuits! I will try this one day as they look awesome and I am sure they are tasty! i do not hv idea how to get that oozing peanut butter out from the cookies but if i do come across any, i will let you know. But still, i think this is one great pb cookie, i dont think anyone can resist a good pb cookie. i actually think the cracks and the sights of pb on your cookies give them more character!! beautiful! wow Jasline!! Totally in love with your cookies. Can’t get better when you have peanut butter and chocolate! Thank you Joyce! I even tried to freeze them then cut into pieces, but they softened way too fast, I think it’s because I didn’t use enough icing sugar… haha but it’s a great learning experience! Thank you for the compliments Smidge! And I’ll finish the other half of the cookies! 😉 Glad you like them! Ooops Bobbi, I hope I hadn’t made you spoil your keyboard 😉 Yea… I’m hoping to get the filling to ooze one day! Thank you! I think Oxford needs to include “peanutbuttery” this into their dictionaries 😉 I’m glad you like them! WOW, Looks so tempting! Wish I could grab one now! If the filling is too soft to be wrapped up, why not try refrigerating the rounded fillings for 15-30 minutes first, maybe this might help in easier wrapping. Have a nice day, Jasline! Lucky friends you got! They look fantastic!! So thick and dreamy! These cookie look so delicious! 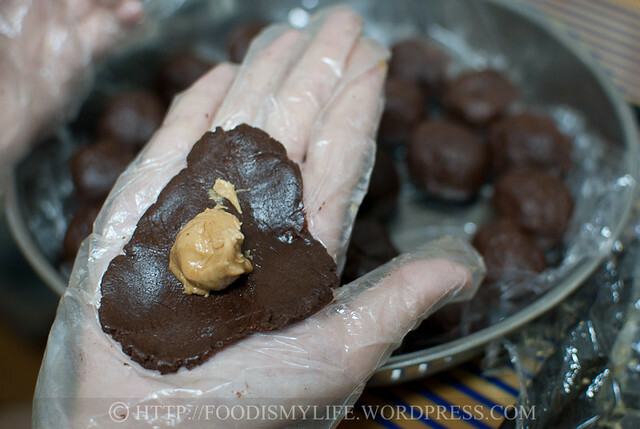 Love chocolate and peanut butter, and the castor sugar on top?! wonderful cookie! Wow, Jasline, these are so pretty as well! I love the little streaks of peanut butter filling showing through and the thickness of the cookie! I was “virtually” tasting each bowl as I scrolled through, lol, I’d have half the cookies you did just by eating everything along the way!! Aww thank you! These cookies are indeed irresistible! Yeah it is a surprise inside the chocolate cookies.. Hmm…yummy. I’m drooling. I have to go wipe my key board down. Oozing peanut filling is sure to be a hit with your friends. These look delicious. And you took such great and clear process photos! Again, wonderful step-by-step photos. And, I love peanuts so these wouldn’t last long! I’ll be making these cookies, they looks so delicious, soft chewy and peanutbuttery (hey thats not a word but it works) Great recipe, totally love it! Love the new font and layout too Jasline, the blog looks gorgeous!!! They look amazing! I love how the peanut butter is peeking through too. Very pretty.